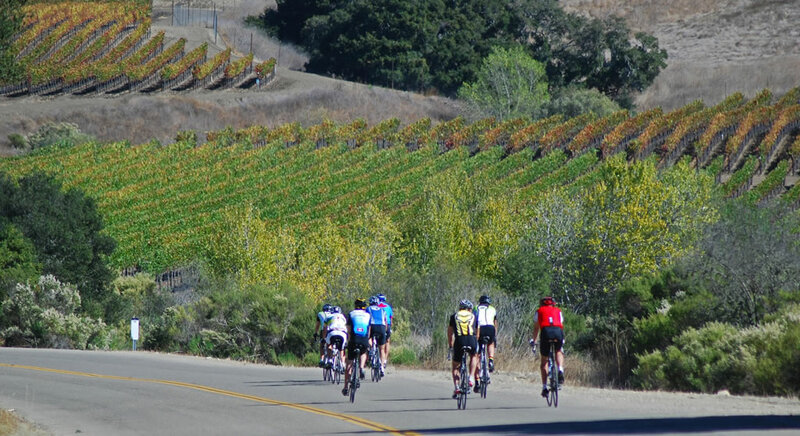 This intermediate route begins with an easy warm-up ride into Los Olivos before the first short climb on Foxen Canyon Road. There are two climbs, the second is a long circuitous road through a canopy of oak trees with views of the San Rafael Mountains at the summit. The descent follows the Sisquoc River Valley passing rangeland, expansive vineyards and the picturesque San Ramon Chapel built in 1875. The midway point is Rancho Sisquoc Winery, a secluded vineyard tucked away in the hillside and surrounded by walnut trees and grapevines. Enjoy our signature farm-to-table lunch with wine tasting to follow. After a leisurely respite, pedal back into town and then over Ballard Canyon to our store in Solvang. Shuttle service available to transport purchased wine and/or tired riders for the return back.